The RANGER 3+ Nozzle Skid offers a modular Quick Attack platform with a water/foam nozzle for early response operations. Applicable uses include fire suppression, vapor mitigation, and personnel protection during flammable liquid and gas related events. THUNDERSTORM W813A 1x3 AR-AFFF is a foam concentrate delivering exceptional firefighting performance, combining fluoro- and hydrocarbon-surfactant technology to provide superior fire and vapor suppression for Class B, polar solvent and hydrocarbon fuel fires. Xtreme Industrial Fire & Hazard Response Training offers firefighters an opportunity to challenge and enhance their industrial firefighting skills through practical field training and hands-on live fire exercises. Join our next event in College Station, TX – June 3-6, 2019. The WILLIAMS FIRE & HAZARD CONTROL Response Team has successfully responded to over 250 major incidents across the globe, giving them a distinct understanding of flammable liquids and the tools it takes to fight them. WILLIAMS FIRE & HAZARD CONTROL equipment is a direct result of experience gained in the field on the world's largest and most challenging industrial fires. For decades, we have developed response equipment that has shaped our industry and led the way toward more effective response strategies, with a focus on firefighter safety. Tapping into their extensive response experience on over 250 incidents, the WILLIAMS FIRE & HAZARD CONTROL response team helps identify site-specific hazards and fire protection solutions tailored to each unique scenario. For Facility Evaluations, Incident-related Preplanning, Emergency Equipment Logistics or Full Service Response Deployment, look to WILLIAMS FIRE & HAZARD CONTROL Services to help protect your people and business assets from fire risks. Emergency response information in the palm of your hand! The WILLIAMS FIRE & HAZARD CONTROL App provides an educational, pre-planning and incident command tool for emergency management personnel operating in crude storage terminals and tank farms. Quickly and conveniently calculate real-time firefighting requirements such as foam concentrate needs and hose friction loss in the field or in the classroom. The app also provides direct contact with the WILLIAMS FIRE & HAZARD CONTROL Emergency Response Team. 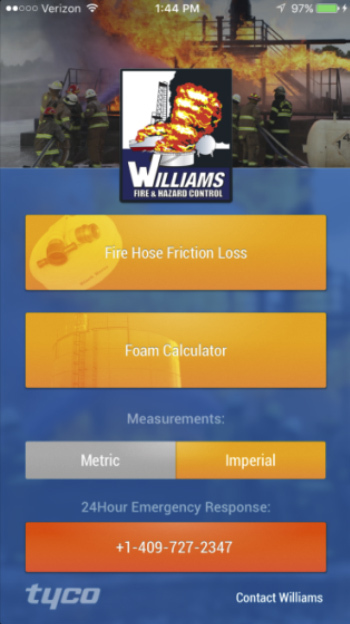 Download the WILLIAMS FIRE & HAZARD CONTROL App Today! Since 1980, the WILLIAMS FIRE & HAZARD CONTROL Response Team has responded worldwide to land and marine based flammable liquid fires, building a history of successful extinguishments — in many cases doing what our contemporaries thought to be impossible. Fires in depth involving hydrocarbon and alcohol based products, pressure related fires, subterranean fires, hazardous material fire and mitigations … the gamut of scenarios encountered in industry and in extreme municipal environments have been subdued by our tactics, and the tailored equipment and foam concentrates we have developed specifically for these challenges. One of the most vital assets WILLIAMS FIRE & HAZARD CONTROL products and services bring to bear on any incident is experience. From assessment to response, from incident command to equipment design, nearly 4 decades and over 250 successful deployments result in strategies, tactics, and proprietary equipment with an unrivaled record of achievement in the field. Contact us to learn more about WILLIAMS FIRE & HAZARD CONTROL products & services.